I'll Take One to Goâ€¦â€¦. I am back for a visit in the UK and having a great time. The holiday rental we are staying at has a nice cafÃ© downstairs and every morning I have to run there to get my morning coffee. Forgetting some of the lingo differences in culture I asked a 'one cup of coffee to go'. The server gave a grin and I knew I said it wrong! It's not 'to go' it's 'take away'. I headed over to Melina Bingo after a very busy day to unwind and play a few games of bingo. 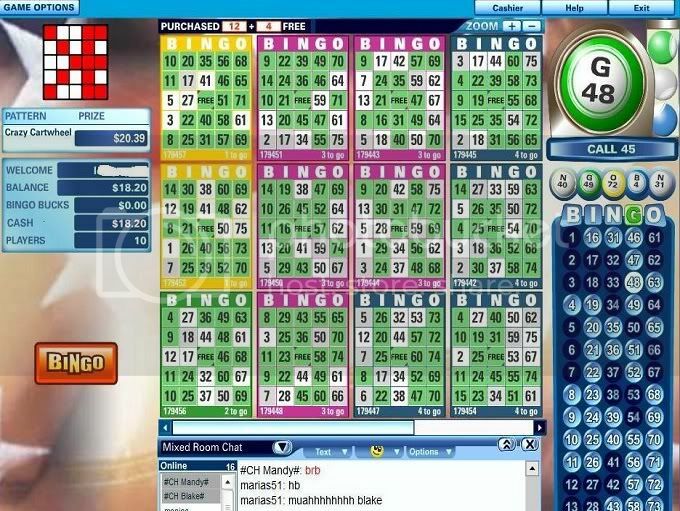 I love free cards and this game was purchase 12 bingo cards and receive 4 free. I had an added bonus of entertainment reading the chat! There was some big time flirting going on between 2 players that were getting pretty steamy. A lot of hugs and kisses and sweet pet names being called back and forth. Before I realized it I needed one to go on two cards and decided to focus on the caller and not the love birds in chat. The pattern was Crazy Cartwheel and I needed lucky 7 or 17 to declare bingo. The bingo cash prize was worth $20.39, a sweet pot where I could double my bankroll. Whenever I need a bingo on more then one card I always think this it, I am going to win! Oh how wrong I was again. It was a 'one to go day starting with my coffee and ending with a player taking away my chances to win!